Huawei sub-brand Honor is preparing to launch an intriguing smartphone in the next few days. The model in question is called the Magic 2, and thanks to the latest leak, we won't have to wait until its October 31 announcement to see why the company considers it enchanting. A trio of live images has recently surfaced on SlashLeaks. The high-quality shots appear to be a part of some hands-on session and they give us a clear look of the Magic 2. The first two pictures showcase the Magic 2 from the front. 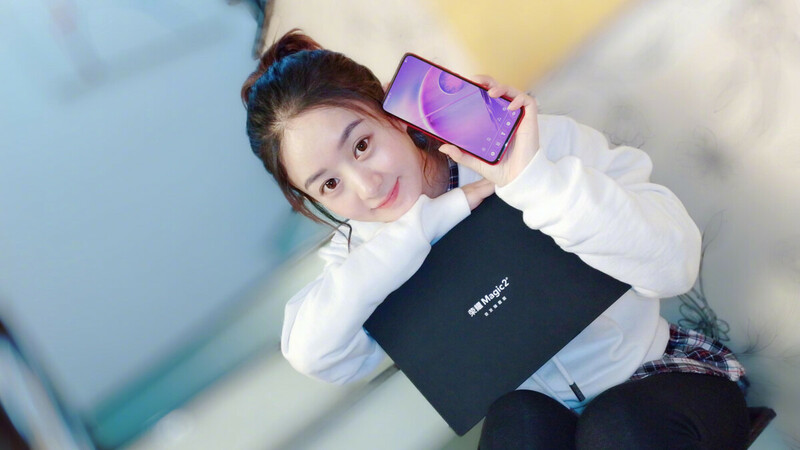 It will employ an interesting sliding mechanism in the quest to achieve a true all-screen look, much like the Xiaomi Mi Mix 3 and Oppo Find X. There have been teasers depicting the design of the device, but here we can clearly see just how slim the front bezels are thanks to the lit up display. The screen almost seems to run off the edge on three sides, while the "chin" at the bottom looks quite thin. Honor's mysterious YoYo assistant also makes an appearance here. The third and final picture shows off the phone's back side. There's a striking resemblance to Huawei P20 Pro model here due to the vertical camera setup in the corner that makes use of three rear cameras. This time around, though, Honor has reduced the gaps between individual sensors and extended the main module slightly in order to fit in a dual-tone LED flash, rather than placing it below the whole setup. This is also the first time we're seeing the Magic 2 in red, meaning that we'll see at least three color variations for the device (the other leaked colors are blue and black). Specs wise, the Magic 2 will be powered by the Kirin 980, Huawei's most powerful SoC to date. It’s unclear at this point which camera sensors will be included on the rear, although those present on the Huawei Mate 20 are likely candidates. This means that a main 20-megapixel camera could join a second 20-megapixel wide-angle one, and a third 8-megapixel sensor complete with a telephoto lens capable of 2x optical zoom. Initial availability will likely be limited to China, but it's expected that the smartphone will launch in international markets such as Europe at a later stage. I was going to wait for this and the Mix3 to launch but decided to go ahead and buy the Nex S. Cons in my opinion of this phone and the Mix3 are the sliding mechanism (susceptible to failure and finding a good protective case) and no 3.5mm jack. My Mix2 doesn't have one either and it's infuriating when you forget the adapter. I know the Nex has a pop-up camera but I barely use them anyway so if it fails I don't really care. No thanks. One more thing to charge and lose. A decent pair of fairly cheap earphones are good enough for me. I wish I could buy a Samsung pair, their sound is excellent. Then just get a phone that has an audio jack like the S9. Errrmm the Vivo Nex S I just ordered has an audio jack. I said like the S9, I wasn't saying that Samsung is the only company that still has audio jacks on their phones. Perhaps. But it's quite clear from my original post that I chose the Nex partly because it has a 3.5mm jack. The reliability of sliding mechanisms shouldn't be an issue for at least a few years. By then you'll have upgraded anyway, so what's there to worry about. I'd dare say it's probably more reliable than a pop-up camera, which would have much smaller mechanism and will likely be more susceptible to dust and such. You must have missed the part where I said I don't care if the pop-up camera fails since I never use it. But more importantly I want to be able to use a one piece case for maximum protection. The only cases I've seen for the Find X are a two piece magnetized/adhesive contraption. I spy with my little eye... Bottom chin :D Ok looks pretty good!!! If this ended up having the same camera setup as the Mate 20 Pro, I might opt for it instead.